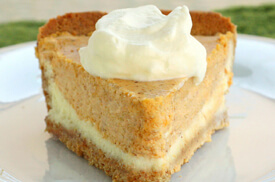 This cheesecake is so light, that we should call it a “Pumpkin Mousse Cake”. This dessert is perfect for a Thanksgiving dinner or any other special occasion. I guarantee it will be your new favorite cheesecake recipe! This class also includes a recipe for Crusted Salmon with Lentils.